Wilson disease or hepatolenticular degeneration is an inherited metabolic disorder that causes an inability to chuck out dietary copper. Dr. Samuel Wilson first described this disorder back in 1912 and highlighted what happenes when body failed to get rid of copper. Too much copper in the body can cause serious damage mainly to the liver and brain, but may also affect the cornea and kidneys. This genetic condition is quite rare though and only affects 1 in 30,000 people, which may well be one of the reasons why most physicians don't expect a patient to have this disease when they first come for a checkup. Most symptoms of Wilson's disease don't appear until young adulthood, which is why early diagnosis is difficult. Some of the symptoms, such as antisocial behavior, tremors, slurred speech, are common symptoms for patients suffering from Parkinson's disease and schizophrenia, which is why the physicians often misdiagnose Wilson's disease. If left untreated, Wilson's disease can lead to several complications such as trembling hands, indistinct speech, seizures, difficulty in swallowing, cirrhosis, fatty liver, central nervous system dysfunction and death. A striking yet rare complication is the wild wing-beating of the arms that makes a patient to injure his/her abdomen and chest. Early diagnosis can greatly help prevent long-term disability and other serious complications. Wilson's disease is the outcome of an irregularity of chromosomes. A specific gene ATP7B on chromosome 13 stops working and affects how the liver cells work to remove excess copper from the body. Under normal circumstances, the liver cells would transfer excess copper into the bile, but a faulty gene hinders this process, causing copper accumulation in the liver that eventually moves into the bloodstream and damages the brain and other bodily organs. How Is Wilson's Disease Passed Down? As Wilson's disease is an autosomal recessive disorder, it requires 2 abnormal ATP7B genes to trigger. If you have Wilson's Disease, it means your mother and father should be Wilson's disease patients or carriers, having at least 1 abnormal gene, and both of them transfer this gene on to you. You won't have the disorder if you get only one abnormal gene. Eye Exam: Kayser-Fleischer rings or golden-brown discoloring on your eyes is a symptom of Wilson's disease. 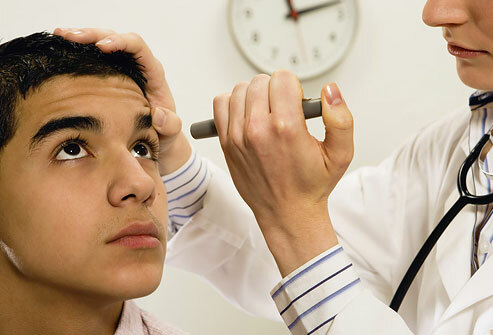 Your doctor may look for it through a microscope and a slit lamp for confirmation. Blood and Urine Tests: A series of blood tests may be required to find out more about your liver function, chase down any genetic mutation and monitor the copper levels present in your bloodstream. A urine test tells your doctor about how much copper is excreted from your body within 24 hours. Liver Biopsy: It involves taking a sample of liver tissue for further testing. Laboratory tests will confirm if there is excess copper in your liver or not. Genetic Testing: If this disorder runs in your family and someone else has already been diagnosed with it, your doctor may opt for genetic testing and screen siblings. This helps develop a treatment plan even before the symptoms arise. Wilson's disease requires lifelong treatment to regulate the amount of copper in your body. Initial therapy is focused on removing excess copper from your body with different medications and easing the symptoms. It is difficult for sure, but the patient feels better once the symptoms are treated. The first step towards living with Wilson's Disease is to limit copper intake and avoid copper-rich foods. You should perform some researches and find out the nutrient values of different foods. You may have to eliminate food like shellfish, liver, mushrooms, chocolate, nuts and the like from your diet. It also benefits you to have your tap water checked for how much copper it contains. You should avoid any multivitamins that contain copper. Your doctor will prescribe medications that will reduce the amount of copper in your liver tissues. Some medications can bind to copper and flush it out through the kidneys or gut. The process is called chelation and the medications used for this include Penicillamine and Trientine. Using medications that contain zinc acetate may also help because it stops copper from being absorbed in your intestinal tract. Depending on the extent of damage, your doctor may suggest a liver transplant. A surgeon will remove damaged liver and replace it with a healthy one from a donor. A family member can also donate a liver, if the surgeon only wants to replace a damaged portion of the liver.